Mythology wants that the origin of Bronte and its same name go back to the myth of the Cyclops, giants with a human shape, symbol of the forces of nature. The legend tells that the town was founded by the Cyclops Bronte (which means " thunder "). 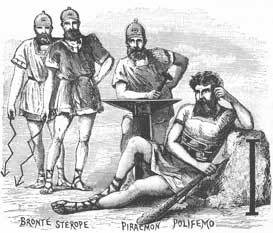 Bronte and its brothers Sterope ("lightning bolt ") and Piracmon ("burning anvil "), being at the God Volcano service, had been condemned to work near the forge of the God within Etna's bowels to manufacture Jupiter's lightings and the heroes weapons. The myth seems credited also by Virgil that in its verses narrates of Bronte and its two friends, divine blacksmiths, in the forge ("Inside a wide cavern manipulated the iron the Cyclops Bronte, Stèrope and, limbs naked, Piràcmon"). On the ancient origin of Bronte from a historical point of view, there is little documented infor­mation and, in any case only few ruins exist to testify the ancient birth. According to some scholars, its birth would go back to the Sicani. Homer's Odyssey is the most ancient book in which Sicily, then called Sikanie, is mentioned and, also something is said about the SICULI (Sicilian). Tucidite (in the Peloponnesian war) tells us that the ancient inhabitants of the island were the Cyclops and the Lestrigons. However nobody says anything about their origin or to which people they belonged. Some Trojans settled in the western part of Sicily with the name of Elemi and were concentrated between Erice and Segesta. At last, in the island settled down the Siculi coming, according to some historians, from the southern part of Italy, because driven away by the Opici. These, the Siculi, with the force of arms, occupied the oriental part of Sicily and relegated the Sicani in the western part of mount Etna. Here, exactly in this area, they would have founded Bronte. In two districts at the feet of Etna (Musa and Zucca) surely inhabited groups of ancient Sìculi, pushed subsequently from terrible eruptions to go towards safer places that could have been Maletto, Santa Vènera, Rocca Calanna, Cisterna, Corvo, etc.. 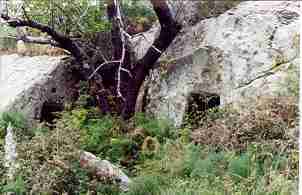 This is testified by the numerous funeral cells shaped like ovens ("the gruttitti") recovered in grottos between Maniace, Maletto and Bronte (a typical example are those present at the base of Rocca Calanna of Difesa), the prehistoric traces of rocky villages and huts ("the pagghiari") scattered all over the territory comprised between Randazzo and Adrano. In an area that confines with the territory of Maletto (at Santa Venera) have been disco­vered remains of a boundary wall of the siculi period with rooms of circular, square and polygonal shape, and fragments of terracotta vases and objects in bronze. Other testimonies have been recovered in the areas: Fontanamurata, Mangiasarde, Margio­grande, Cisterna, Primaria, Rinazzo, Contura, Barbaro, Fontanazza, Marotta, Sciarotta, Cantera, Serra Stivala, Bolo, Tartaraci. The recovery of other archaeological finds (bricks, tombs, funeral objects, amphorae, coins and medals) and of vases of fine clay reveals also the presence in our territory of Greek colonies; therefore, through here passed, Roman, Carthaginian and Syracuse's armies. Incontrovertible traces of Arab influence are also picked up as the topographical references (Plain Saraceno, Saracena Cave, etc.) or the great number of Arabic words presents in the brontese. The brontese poet Prof. Pasquale Spanò in one its poems of the 1941 in the book "Etnei" (Turin, 1993) narrates the origin of Bronte with a legend that speaks about Cyclops "laborious and human" (Bronte, Piràcmon and Stèrope) they lived on the western flank of mount Etna, along which a river slid. They helped Volcano in the workshop that he had under the mount. Not like Polifemo, they taught the men many things, between which the use of fire, than Promèteo had take away front the Gods. One day, near the river, they saw three nymphs, Scibìlia, Salìcia and Rivòlia and were conquered by their beauty. To their wedding followed the foundation of Bronte, that it was populated by their descendants, one exceptional race full of talent. Of divine origins and for a long time, happy, the Brontese were transformed in "common mortals" by the unbridled desire "to possess", brought between them by sly people. The Nymphs and the Cyclops, very grieved, went away from the city, that was destroyed by a disastrous Etna eruption. The Cyclops Bronte, Sterope, Piracmon and Polifemo. The image is taken from "The History of the Ci­ty of Bronte" by Gesualdo De Luca. The Cyclops, according to the Greek mytholo­gy, were gigantic beings with only one enor­mous eye in their forehead. In Esiodo, the Cy­clops were Arge, Bronte and Sterope, three of the sons of Uranus and Gea, personification of the sky and the Earth. Cronos, one of the Titans, also sons of Uranus and Gea, dethroned Uranus and got the Cy­clops to be thrown down in the underground world. When the son of Cronos, Zeus, fighting his fa­ther, freed them, to thank him they donated the thunder and the lightning bolts with which he defeated Cronos and the Titans, becoming the­refore, in its turn, master of the universe. In the Homer Odyssey the Cyclops were she­pherds who lived in the Italic coasts; barba­rians and cannibals without any laws, did not fear neither gods nor men. The Greek hero Ulysses remained caught with its companions in the cave of Cyclops Polife­mo, son of Poseidon, God of the sea. The giant devoured many Greeks, but Ulysses got him drunk, blinded it with a red-hot pole, and escaped with its fellow survivors. 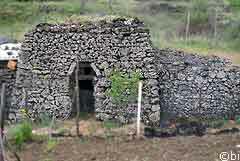 This funeral little cell, testimony of an ancient ci­vilization, shaped as an oven (the "gruttitta") is fairly close to Bronte in the Difesa district, at the base of Rocca Calanna. An ancient type of Mediterranean room, initially appeared singularly but afterwards became the inhabited unit of the primitive. 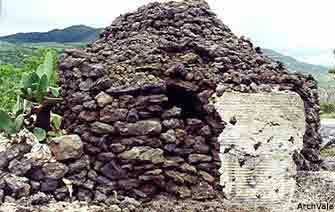 prehistoric villa­ge. Our progenitors, Sicani and Siculi, probably began this way their relation to life, trying to co­py what nature had offered them with natural caves. Heterogeneous people have contributed to make the history of Bronte but, naturally, this coincides also with the one of the Volcano that stands over it. Unfortunately in the silent millenarian fight between Bronte and mount Etna often the fury of the volcano has had the territory devastated and, in the past, also the settlements of our forefathers, canceling, forever from history, the first traces of the civil organization of our people. The Etna does not make possible any minimal search as it holds everything hidden in its womb under wide and high layers of lava. Here it is a short list on the presence of the many people who have conquered and domi­nated our territory during the past centuries (Greek, Roman, Arabs, Normans, Svevi, Angioi­ni, Aragonites, Albanians).